Thanksgiving is less than 10 days away!! Do you already know what you are going to make? If so, great!! But wait! I think I hear something knocking. I made this last Thanksgiving and it was so good I’ve made it several times since. On a 1 to 10 scale in terms of flavor and complexity this ranks a 10. I have never made anything as complex as this and have yet to come across something I can compare it to. Whether you want to impress your family, your dog or the pool man. This could be the recipe of the year. Just make sure to leave the window open so the pool man can smell you cooking. I originally came across this recipe in Bon Appetit’s 2015 Thanksgiving issue. From which, I made a few dishes, all of which were winners. So shout out to Bon Appetit for that ! Now let’s deconstruct and see what makes this work it’s magic. Mint: The first time I made this I did not have mint unfortunately. The mint takes this dish to a whole new level. I did not know what I was missing until I made it the second time. You not only get a hint of mint flavor, but also the menthol aromas when you break those little leaves in your mouth. If you don’t like mint, don’t worry. It is not a dominant flavor at all. If you use as much as I did, you’ll only get a tiny taste every other bite at most. If you love mint, you can always keep some on the side and add more! NOTE: If you want a real unique flavor use chocolate mint instead of regular spearmint. Chocolate mint has a very distinct flavor and I like how it goes with the smoked paprika. I think they should get married. 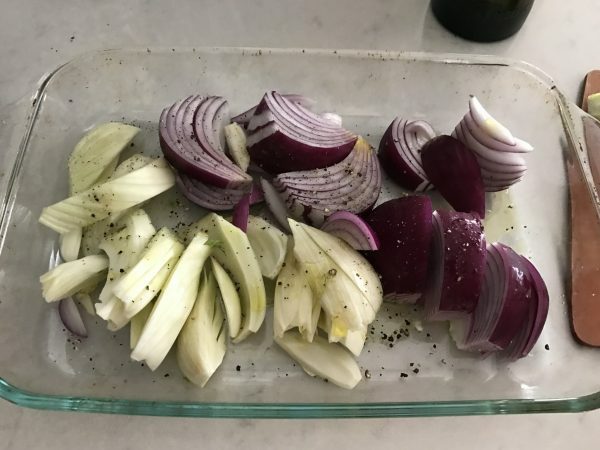 Fennel: The other thing that I have since changed is increasing the fennel and decreasing the red onion. I love red onion, but I also love fennel. 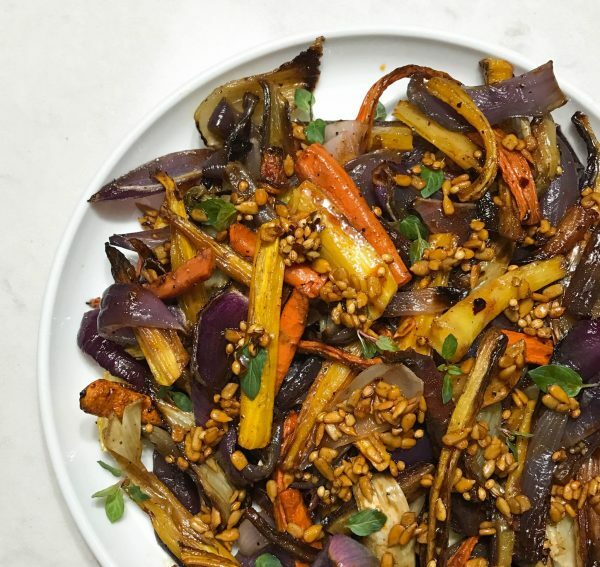 I think the fennel forms the base flavor of the dish along with the spiced vinaigrette. So I roasted fennel and red onion in about equal proportions. Carrots: The carrots, to me, act more as the ‘filler’ or the vehicle for all the other delicious goodies on this plate. 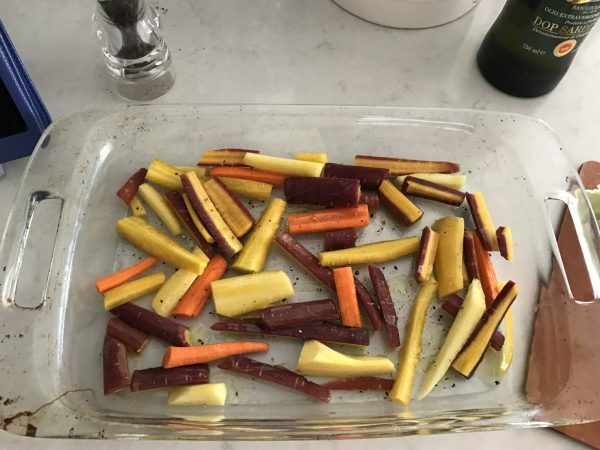 The original recipe calls for regular carrots but I like the different flavors of tri-color or Rainbow carrots so I have used those ever since. Coriander – this is the aromatic backbone to the vinaigrette. Crush your coriander seeds thoroughly to get as much flavor out as possible. I used my knife and smashed them. Sunflower seeds add a nutty dimension and firm texture to each bite. Would not leave or substitute these out. Sherry Vinegar-dark, sour, tart. I could see how using another vinegar like red wine would work as well. But would stay away from anything sweet. Temperature- The original recipe says to allow things to cool off. But I think if possible you should try to serve this as warm as possible. It tastes great at room temperature, but to me tastes even better warm! I know at Thanksgiving it can be difficult to eat everything hot, but consider keeping it in a warm oven until ready to serve. You could even cheat and make this ahead and just microwave it. But you might be tempted to eat it all before the time comes!! Thanks for reading and don’t forget to sign up for my email list for updates! Preheat oven to 425°. Place carrots on a rimmed baking sheet and onions and fennel on another sheet. Drizzle each with some olive oil and season with salt and pepper. Do not crowd otherwise the veggies will steam each other and not roast well. Use more than one sheet if necessary. Roast and mix at least once, preferably twice until golden brown and tender. Approximately 45 minutes. 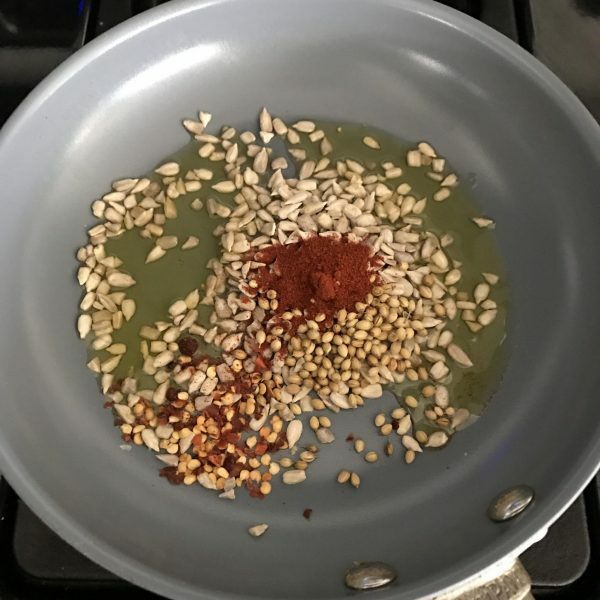 Meanwhile, cook sunflower seeds, coriander seeds, red pepper, smoked paprika, and 2 Tbsp. olive oil in a small pan on medium heat. Mix well and cook for no more than 2 minutes. Remove from heat and add vinegar and lemon juice. Add some fresh cracked pepper and stir. Once vegetables are roasted combine them all into a bowl and mix. Drizzle vinaigrette and add mint. Mix thoroughly and serve! Garnish with additional mint. In the photos I used Pyrex glass to do the roasting. Rule of thumb for glass is to decrease the temperature by 25 degrees. Otherwise they will roast much faster than you want! Can I take this with me to heaven!? SO YUMMY! Corinna, thanks for the note! I’m totally with you, it makes your whole house smell fantastic!! Hope you enjoy the dish and Happy Thanksgiving! it was delicious! i don’t even like fennel but this was super tasty. also quick and easy. will definitely make this a regular. 🙂 happy thanksgiving! Helen thanks for hosting and also stopping by! Happy Thanksgiving! Your food always makes me drool! Looks wonderful I especially appreciate the clear photos. Thanks Elizabeth hope you get a chance to try it :D! This looks amazing! I am going to print it out and try it ASAP (which probably won’t be until next week, sadly). Thanks for stopping by Sarah!! let me know how it goes :D! Wow, some great flavours going on here! I can’t get enough fennel in my life – will give this a go at Christmas! Thanks for the note Betty !! let me know how it turns out! I am literally drooling. Looks delicious! Oooh wow, sounds and looks great. Would be a fantastic side with some grilled chicken or something. Awesome! Thanks for the note !! it definitely would !! This sounds so good and so unique. Well it would be in my house. Thanks for the inspiration! 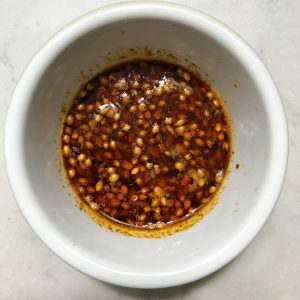 Sherry vinaigrette with sunflower seeds? I love it! 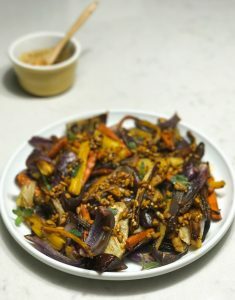 I love crunchy stuff to the idea of adding crunch in the vinaigrette sounds amazing. Thank you Rachel! it blew my mind the first time i had it !!! I have always been terrified to cook fennel, but you have definitely inspired me! dont be, its just like an onion!! 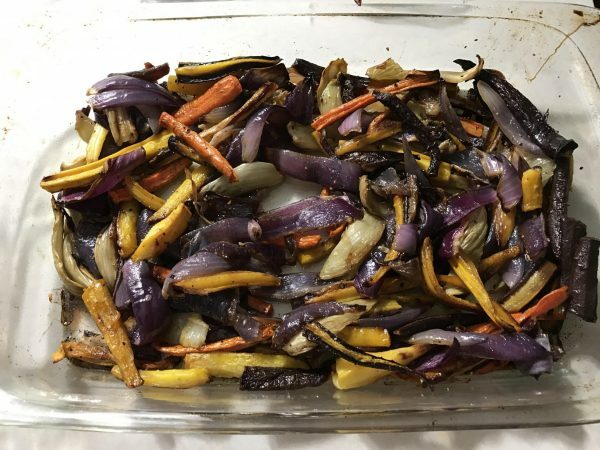 Love flavor of roasted vegetables. Adding the spices sherry well I can smell how good it is already. thank you Candy, it will make your house smell fantastic ! Very very nice. Would love to try this one at some point. Thanks for the note Esme !! let me know how it turns out!
? not sure when I will get to it but will do.